This comes from a new discovery: Every Grain of Rice by Fuschia Dunlop. We’ve been looking for a Chinese cookbook for some time and this comes up trumps. This beef dish tasted authentic and delicious. Don’t be tempted to substitute the Laoganma black bean sauce with the more common black bean sauce, widely available in supermarkets, which is something completely different. Laoganma black bean sauce is a relish made from fermented black beans and dried chillies in oil. You can find it in any good Asian supermarket (where you will also find the Shaoxing wine and potato flour). Stir the marinade ingredients with 2 tsp water, add to the meat and set aside. Cut the peppers into strips similar in size to the beef and coarsely chop the coriander. Heat the oil in a seasoned wok over a high heat. When the pan is smoking hot, add the beef and stir-fry until the strips begin to separate out. 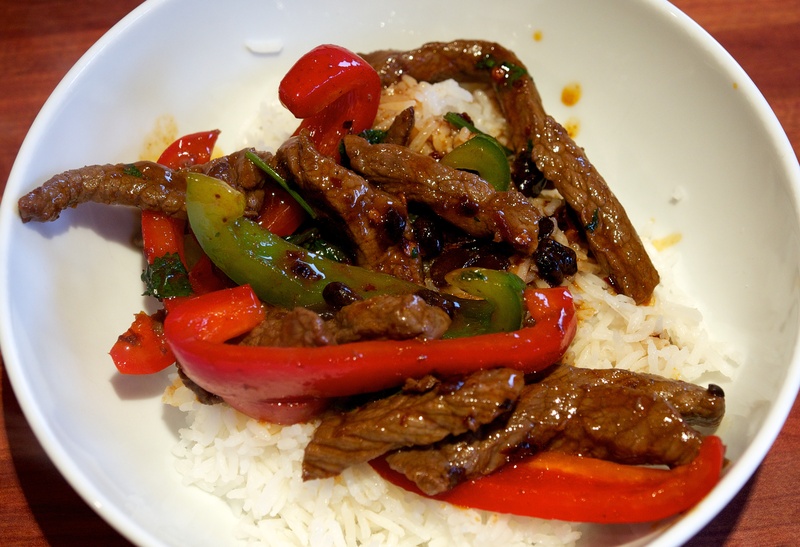 Tip in the peppers and keep stir-frying until the beef is almost cooked. Add the black bean sauce and stir, then add some salt to taste. When everything is hot and fragrant, stir in the coriander. Take off the heat and add the sesame oil before serving with some plain white rice. Inspired by Gok Wan, this works a treat. We always found that getting fresh squid was difficult until we found great frozen ones: flash frozen as soon as they’ve been caught. A spanish chef Jono knows swears by them and we do too! This is a healthier take on the deep-fried salt chilli squid you get in restaurants. Wine Suggestion: A fresh, light to medium-bodied white with good fruit works a treat here, but just make sure it’s not bone dry as you need to balance the chilli. We’d suggest either a good Albariño / Alvarinho [we drank the Saolheiro Alvarinho from Portugal) which complements the saltiness or a dry German Riesling from a good producer like Leitz in the Rheingau or Dönnhoff in the Nahe which will carry a good level of fruit and taste dry. These really balance fruit with acidity for perception as opposed to an Australian Riesling which really is bone dry and will fight with the chilli. Put the cucumber into a serving dish. Pour over the vinegar and sugar and set aside. Slice the squid tubes in half lengthways and lay out flat with the inside facing up. Score the tubes at an angle about 5mm apart but take care not to slice the whole way through. Turn the squid 45 degrees and score again at that angle. Once scored slice the squid into 2cm wide strips. 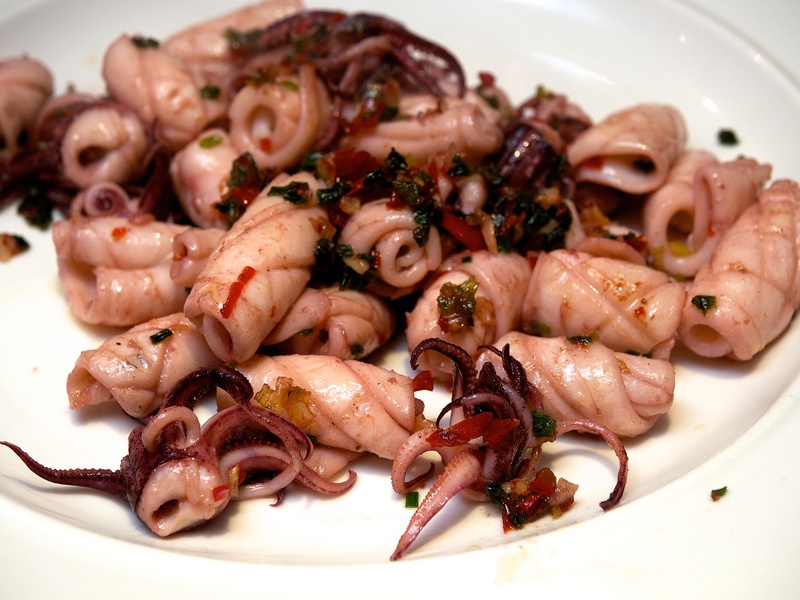 Cut large tentacles in half and leave small ones whole. Heat a wok over a medium to high heat and add the oil. Add the chilli, garlic and spring onions and fry for 4-5 minutes, or until starting to dry out – take care not to burn the garlic. Remove from the pan and drain on kitchen paper. Put the wok back on the heat and, when hot, add a splash of oil. Wait for the oil to smoke, then add the squid and stir-fry for a minute, or until half cooked and starting to char at the edges. Put the garlic/chilli/spring onion mix back into the pan and stir through, tossing over the heat until cooked through. Taste and adjust the seasoning. This soup is absolutely delicious and super simple to throw together. We made a main meal out of it by serving it with some shop-bought spring rolls. Try and use freshly ground white peppercorns if you can as they give a subtle spiciness that works really well with the aromatic ginger. Lightly beat the egg whites until frothy. Add the egg whites to the crabmeat along with the blended cornflour and stir well. Put the stock and ginger into a large saucepan and bring to a simmer. Add the sweetcorn and bring back to the boil. Reduce the heat slightly and simmer for a few minutes. Add the crabmeat mixture and some seasoning. Let it simmer gently and keep stirring for a few minutes until the soup has thickened. Taste and add more seasoning if necessary. Serve in warm bowls with the scallions scattered over the top. Wine Suggestion: We didn’t actually try this but, having discussed it at length, we reckon an Austrian Grüner Veltliner might work here. Grüner has a savoury peppery character which should complement the peppery flavour of the soup. You don’t want it to be too heavy though so go for one that is no higher than 12.5% alcohol. A great introduction to an exciting chef, the winner of Australian Masterchef, Adam Liaw. He does some really exciting Asian food – well worth a trip to the Asia market! 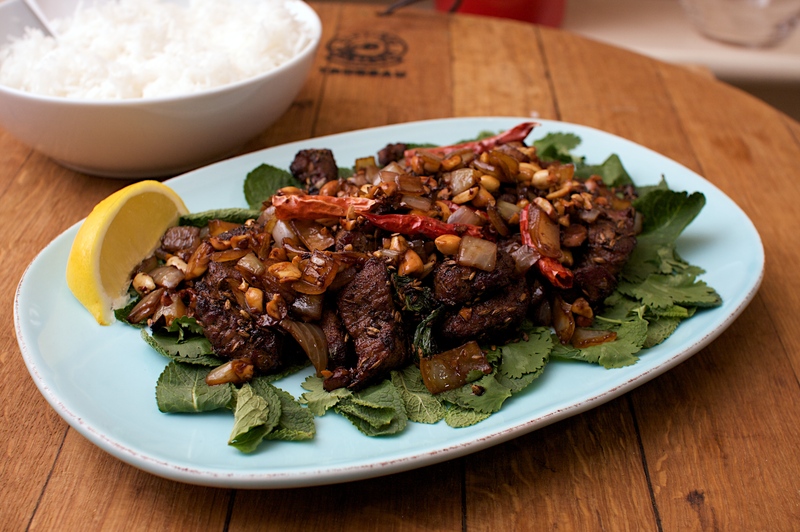 Lamb fried with cumin is a classic northern Chinese dish, Adam has given it a bit of twist and turned it into a warm salad with a peanut relish. You will need a thermometer for this, the sort that you use for jam, you can pick one up in a kitchen shop for under €10. We bought one to cook this dish and have already used it again for something else. If your peanuts have the skins on just blanch them for a minute in hot water and they will slip off easily. Half-fill a wok with vegetable oil and heat to 180ºC. Toss the lamb in the cornflour and deep-fry for 3-5 minutes or until well browned. Lift out with a slotted spoon and drain on paper towel. Drain the vegetable oil from the wok. Heat half the neutral oil in the wok and stir-fry the peanuts until golden brown. Remove with a slotted spoon, drain and roughly chop. Add the onion and garlic and stir-fry for 1-2 minutes or until softened and starting to colour. Add the soy sauce and sugar and stir-fry for 30 seconds. Return the peanuts to the wok with the chillies and toss for about 30 seconds. Remove the mixture from the wok and set aside. Heat the rest of the oil in the wok and add the cumin and chilli powder. 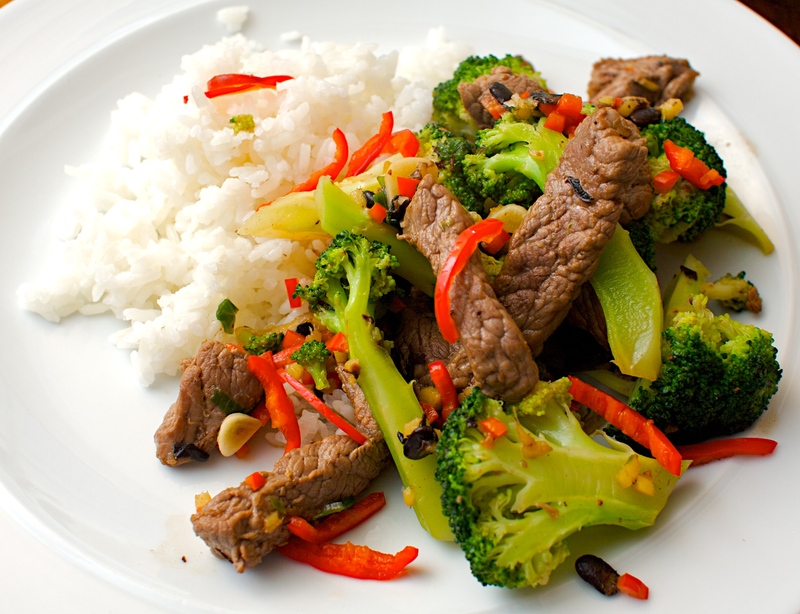 Stir-fry for 30 seconds (or until it starts to aggravate your nose). Add the lamb, the salt and a pinch of sugar. Toss for about 30 seconds and then add half the mint. Toss until the lamb is wilted, then remove the mixture from the wok. Arrange a bed of coriander and mint leaves on a serving plate and top with the lamb mixture. Spoon the peanut and onion mixture on top of the lamb. Serve with wedges of lemon. Squeeze the lemon over just before eating and toss like a salad. Serve with rice. Wine Suggestion: We have the old conundrum of chillies with wine – they don’t go. We’d probably go for a beer here (lager rather than ale) but if you want wine, a Pinot Gris with a little sweetness and not too aromatic might be good.